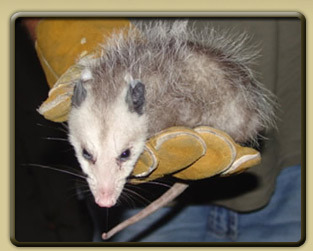 Opossums will raid garbage cans in search of food and enter under decks, attics, walls or crawlspaces in search of a new home. They are prone to chewing on electric wires, tearing up insulation and destroying other property. At this point especially, the Opossum control experts at Cages by Jim need to be called for safe and humane removal of the Opossums. Opossum \(o-) ' pä-sem\ Commonly called “possums”, North America's only marsupial (female has a pouch) mammal. Opossums are capable of having four litters of babies every year and breed from January to October. An average litter includes anywhere from seven to sixteen babies. The gestation period of opossums is 2 to 3 weeks. Some males breed as soon as they meet the female. Others take their time. The female becomes angry toward the male about a week after the breeding occurs.